In November 2001, an exciting $700 million-dollar project began in Oklahoma City, Oklahoma: The public school system would be modernized and upgraded. Part of the renovation would take place in the Emerson School, a 120-year-old building—one of the first public schools built in the city. Slated to be removed and replaced with Smart Boards were four old green chalkboards still hanging on several classroom walls. Today, the formerly hidden chalkboards are protected with acrylic glass. Controls are also in place for light and temperature exposure. With this care, the chalkboards could last another one hundred years. To see photographs of the find, visit Oklahoma’s Hidden Chalkboards of Yesteryear. Indeed, 1917 was another era of classroom teaching. Just imagine if the students and teachers from that day were to visit your college classrooms today. How much culture shock would they experience? Do you think they would be able to catch on to your level of technology skill and awareness? Clearly, the technological differences between 1917 and now are staggering. 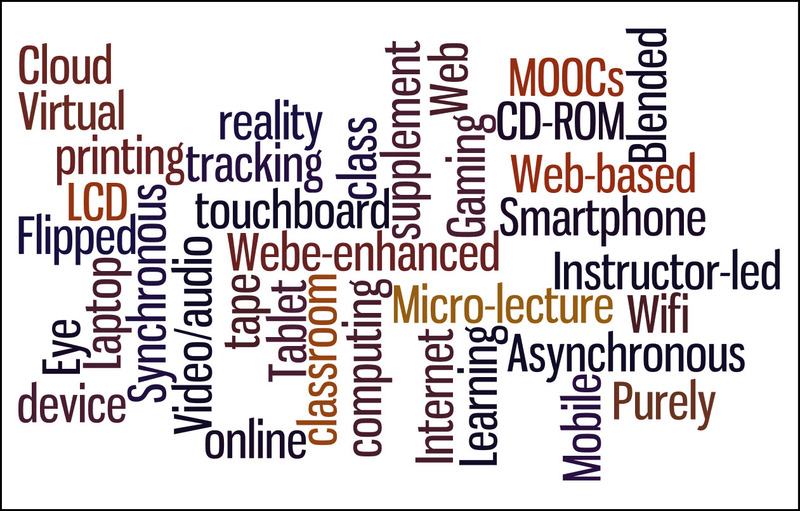 Today we have online classes, blended learning, and flipped classrooms, MOOCs, microlectures, and mobile learning. We have blogs, wikis, podcasts, clickers, cloud computing, virtual reality and gaming. And we have laptops, tablets, smartphones, 3D printing, eye tracking, and LCD touch boards. Then there’s the explosion of social networking explosion—Facebook, Instagram, LinkedIn, YouTube, Twitter, Tumblr, Flickr, and Google+—not to mention the invention of Apple, Microsoft, and the Internet, and, well, online dating! What’s next, and how soon will it come? 85 percent of college-bound students say technology in the classroom and the availability of online classes are their top determinants in choosing a college. The total of 5.8 million distance-education students in fall 2014 was composed of 2.85 million taking all of their courses at a distance, and 2.97 million taking some, but not all, courses at a distance. One in every seven students studies exclusively online; more than one in four students takes at least one online course. Public institutions command the largest portion of distance-education students, with 72.7 percent of undergraduate and 38.7 percent of graduate-level distance students. Students favor laptops as their digital technology of choice. In a study conducted by Harris Poll for AMD (a technology company), 85 percent of study respondents own a laptop, used variously for taking notes during class, doing homework and projects, watching television shows and videos, and conducting multiple other tasks. Forty-one percent of the AMD study respondents reported that they consider the laptop to be more important than a TV, bicycle, car, or tablet. Distance-education enrollments continue to grow. Computer software and Internet resources allow students to record, defend, and challenge their thinking. Digital camcorders allow students to observe and analyze the world—to resee and reimagine it in a way that appeals to them. Interactive whiteboards are helpful for class discussions about ideas or Web content; they facilitate whole-class display and hands-on participation. Student-response systems, like clickers, allow students to respond to questions and then debate the answers. Blogs can serve as personal journals, where students can record, share, and reflect on field experiences and research activities. Students can also use blogs as a preestablished environment for critically responding to assigned readings. Wikis can help students coordinate, compile, synthesize, and present individual or group projects or research, as well as build and share group resources and knowledge. Wikis can also help students provide peer review, feedback, and critiques. Discussion boards can help students establish a sense of community with their class and engage in ongoing threaded conversations on assigned readings and topics highlighting diverse points of view. The following graphic illustrates how different digital technologies can help faculty and students with critical and creative thinking. Notice the six main categories in the graphic. 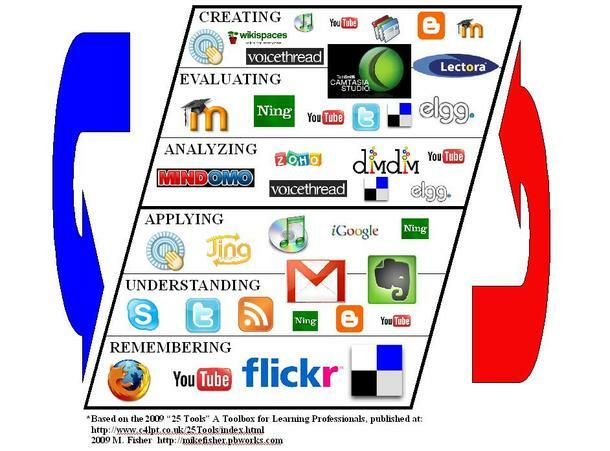 They correspond with Bloom’s taxonomy, discussed in the section on Patterns of Thought. The red and blue arrows outside the diagram indicate the fluidity with which the tools can travel through the different levels in the taxonomy. All in all, the diagram, below, shows the interconnectedness of technology resources in helping users increase their critical and creative thinking skills. If you are thinking about taking an online course or even a blended or hybrid-format course, you already know that it will require some basic technological skills. And while you don’t necessarily need to be a computer scientist to take a class that involves a lot of online work, you should have a solid understanding of the basic technical skills needed to succeed. Understanding what these skills are up front will make things much easier for you as a student. When you have finished this first Getting Tech-Ready tutorial, complete the computer-readiness activity, below. NOTE: You will find additional tutorials, below, from the OEI Online Learner Readiness project. All are geared to help students develop skills required to be successful online learners. Remember that even though you may be a savvy smartphone, tablet, and/or computer user, you may not be prepared for the particular challenge of college-level learning in the online environment. The tutorials below are engaging and interactive, and are designed to address the real challenges that both experienced and novice online students may encounter. Start by going to the Computer Readiness Test. It will test your current browser for specific plugins and versions of Adobe PDF Reader, the Adobe Flash Player, Oracle Java, Microsoft Silverlight and Apple QuickTime Play. These plugins help you better navigate and participate in typical technology-enhanced activities in college. When you are finished with the quick test, it will output the results. Now visit the Online Learning Readiness Questionnaire. You will be queried about your interests in and aptitudes for online learning. Your answers will help you determine what you need to do to succeed at online learning. Post-survey feedback will also provide you with information on what you can expect from an online course. In tutorial #2, below, also from the OEI Online Learner Readiness project, you will investigate online learning as an alternative to a traditional classroom. What will this mean for you as a student? In the tutorial you will be introduced to the world of online learning: how it works, a few of the common misconceptions about online learning environments, and some differences you will encounter when taking courses online rather than in a traditional classroom. Tutorial #3, below, will help you organize for online learning success. This is important for online learners because the format is quite different from a face-to-face (f2f) course on campus. In a “f2f” course, for instance, you’ll typically meet with your instructor and the other students in your class at least once a week and receive frequent reminders about when assignments are due. In an online environment, though, it’s up to you to remind yourself. Luckily, there are a lot of tools available to help you get started. But first it’s important to get organized. Below are two additional resources that complement the online reading strategies tutorial. They will help you use the Internet to find scholarly material and evaluate Web sites for accuracy, relevance, etc. Mobile Learning: By the time the class of 2016 graduates, close to 91.4 percent of U.S. college students will own a smartphone. See the eMarketer data graph showing U.S. college student smartphone users, 2010–2016. In 2010, the number was 8.14 million; the number projected for 2016 is 17 million. Students want and need to use their mobile device for learning. Social Networking: See the eMarketer.com data graph showing the daily time spent on select social networks by U.S. college student Internet users, as of May 2015. The graph answers the question about whether or not young people have given up on Facebook. Clearly, Facebook is still a winner. Social networking can readily facilitate learning. Are You Ready To Be An Online Student?